As an unabashed lover of red carpet fashion and the proud owner of one of those fancy new 4K—don’t ask me what that means—televisions, I’m especially looking forward to tuning in to this year’s Academy Awards. And just like the Super Bowl calls for a certain kind of snack spread, the Oscars, to me, just scream for a fun cocktail. When it comes to making cocktails, I like to make mine seasonal, fresh, and nutrient-packed. It’s the same approach I take to cooking, and right now, at the tail end of winter, what’s at peak freshness is all that beautiful, juicy, antioxidant-packed citrus fruit coming up from the South. In other words: It’s the perfect time of year to craft a cocktail worth staying home for. I love using grapefruit in my cocktails. 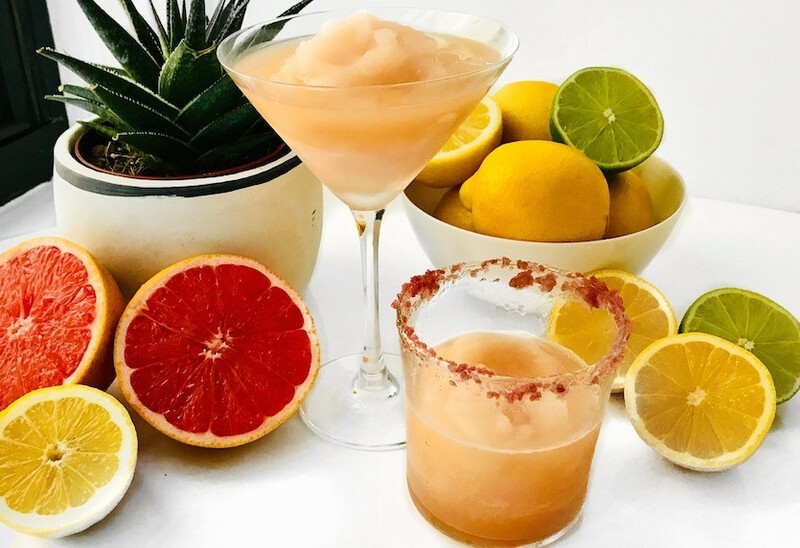 It’s loaded with vitamin C, linked to lowering cholesterol, and adds a tart and unexpected pop to a margarita—which is traditionally made with lime juice, simple syrup, tequila, and triple sec (an orange-flavored liqueur). Instead of simple syrup—which is just totally devoid of nutritional benefits—I use immune-system-boosting raw honey (just a teeny bit!) infused with ginger. Here’s where the fun comes in: making it a slushy. It’s been a loooong time since I’ve ordered a frozen margarita in a restaurant because they tend to be loaded with sugar and artificial flavorings compared to the “on the rocks” option. At home, I can keep my frozen cocktail low-sugar and all-natural. And if you are thinking about all the special equipment that must be needed to make this magic happen, don’t. An ice cub tray or two and a decent blender is all that’s required. Plus it takes less than a minute to go from freezer to glass—which means, of course, that you won’t miss a minute of the red carpet action. Want to try this yummy, low-sugar cocktail for yourself? Keep reading for the recipe. One of the best parts of this recipe is that you can make it ahead of time. So if you’re having a party, the work is already done by the time you hear the doorbell ringing. For a little extra pizzaz, salt the rims. I used honey to coat the lip and outside of my glass and then rolled the honeyed rim in crushed Pinot Noir salt from Jacobsen Salt Co. (I just like the pink color). The ginger honey needs at least a week to fully infuse the ginger flavor into the honey, so do this step as far ahead of time as possible. 1. Pour one cup of honey into a glass jar. Add ginger pieces and cover jar with a lid. Let sit for one week before using for ginger flavor to infuse into honey. 2. Squeeze grapefruits, limes, and lemons into a bowl and strain through a fine-mesh sieve to remove any pulp or seeds. 3. Add one cup tequila and half cup ginger syrup to citrus juices and stir to combine well. 3. Pour liquid mixture into two to three ice cube trays or into one large Pyrex container and place in freezer. Freeze overnight or for at least eight hours. 4. Right before serving, working with one tray of ice cubes at a time, remove cubes from tray or spoon out half the frozen mixture into a blender. Add four to six additional ice cubes. Depending on how boozy you want the drink to be, add less ice to make it stronger. Blend for no more than 30 seconds. 5. Scoop slushy mixture out of blender with a large spoon into two to three glasses. Discard remaining large ice pieces. Repeat with second tray of cubes or second half of frozen mixture and serve. If you’re still looking for more Oscar night cocktail inspo, try one of these seven wellness-guru-approved cocktails or this turmeric honey concoction.